Excipio Energy’s mission is to make offshore renewable energy the most profitable, safe, and reliable source of global electricity. Excipio Energy was created to bring together offshore oil and gas expertise and Offshore Renewable Energy (ORE) technology. Excipio’s goal is to become a first-tier supplier of offshore renewable power to both the grid and offshore oil and gas facilities. The current global focus is on offshore wind, but ORE encompasses capturing energy from winds, waves, tides, ocean currents, and thermal gradients. Excipio’s concept is a modular platform design that captures all ORE modalities suitable to the location. The initial objective is to provide green power to locations where the wholesale price is over 20 cents per kWh. Excipio plans to offer these power-only platforms, which we call an Excibuoy™, under Build Own Operate Maintain (BOOM) contracts. This reduces the risk to the client and can shift a significant portion of the cost of an ORE development into OPEX. This allows Excipio to realize a higher cost per kWh making even the prototype Excibuoy™ a profitable device. As we perfect the platforms and our required price per kWh reduces Excipio intends to migrate to a power company model, selling green electricity to the grid. The act of integrating Marine Hydro-Kinetic (MHK) devices, and where appropriate OTEC, into a floating wind platform has the effect of reducing the LCOE, and our goal is to be cost competitive with conventional gas-fired power plants without any form of subsidies. Excipio Energy Inc. is the parent company based in Houston, Texas. Our organizational model is based on leading a Consortium of companies, each providing a required part of the supply chain, to allow us to offer to our clients either direct power sales, Build Own Operate Maintain contracts, or turn-key products for other operators. Our primary goal is to see integrated platforms deployed as part of the renewable energy matrix. To date we have letters of intent from 12 companies, with 6 more pending. The intent is to have a catalog of ORE products that we can tailor to each market based around a single platform. Once fully funded the intent is to create subsidiary companies to execute each project and to create a subsidiary operating company, Excipio Energy Power Systems (EEPS), to manage those assets for which we have retained ownership. “Simple, scalable, repeatable, reliable” is the design mantra for Excipio Energy’s offshore renewable energy equipment. Excipio have used their expertise, honed on decades of offshore development work, to select the best available technologies. All of our components are proven, provided by known vendors, and will be built and installed by the most qualified Offshore EPC companies. Core to the Excipio business plan is the development of a platform that will be capable of incorporating the full spectrum of ORE technologies. This will make the platform more complex, but the complexity is no greater than a typical offshore oil platform; and the first to market with such a system will have a major technical advantage. We call this integrated platform an Excibuoy™. An integrated solution is important because money spent on hull and deck does not produce revenue; Excipio will reduce the portion of non-revenue producing CAPEX from the current ORE industry average of more than 50% to 25% or less. It is an important distinction between Excipio and an oil company that our risk profile is very different. We do not need to spend billions finding the energy; it is there for the taking. Being lower risk means the returns will be like those of a power company not an oil company. Our greatest risks are not technical but regulatory and political, which we can mitigate somewhat by our ability to work globally. The Excipio team can shift focus quickly to any market that sets up an ORE friendly regulatory framework. In the USA Excipio Energy is convinced that the Gulf of Mexico has a competitive advantage in this regard over other regions due to the prevalence of existing energy infrastructure and development-friendly local communities. The need for electrical energy is growing globally, and with more than 75% of the world’s population living within 100 miles of a shoreline, ORE can be a significant contributor to the worlds clean energy supply. Excipio’s Senior Management each have more than 25 years of experience and access to international resources to carry out our strategic growth plans. We have successfully managed complex offshore projects in some of the most challenging places on the globe. Our multi-cultural experience and ability to communicate in several languages will also benefit our growth. 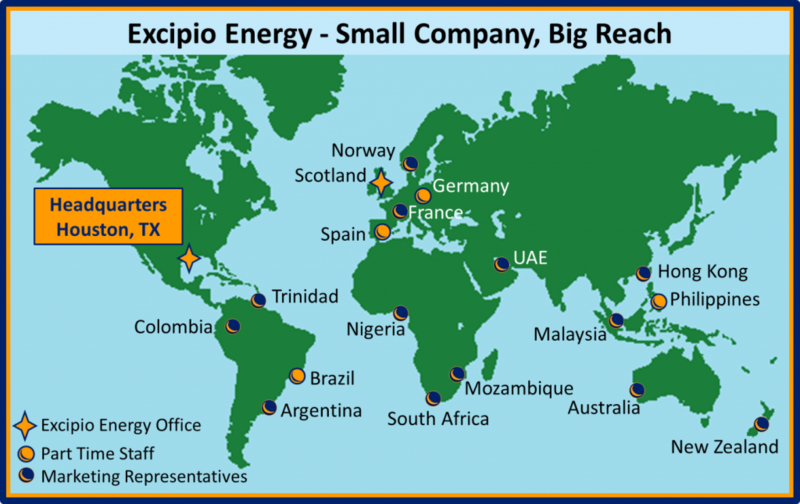 Excipio Energy has been largely self-funded for the past 2 years but to continue as a viable company requires the outside funding, the details of which can be found in the Excipio Energy Prospectus available upon request. The Excipio Management want to retain operational control of the company operations via their current roles, but are open to external ownership, funding tied to successful milestones, and are looking for only reasonable compensation during the formative years of the company. The founding members do not have an “exit strategy” as it is their intent to continue growing the company for the foreseeable future. Copyright © 2019 EXCIPIO ENERGY. All rights reserved.